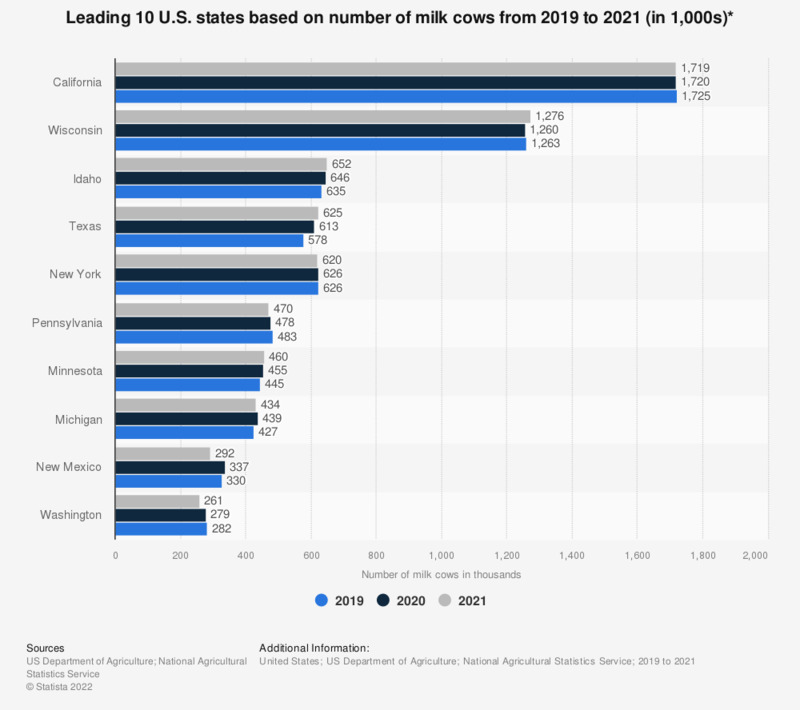 California was the leading U.S. state in terms of the overall number of milk cows, with a total of about 1.8 million milk cows as of 2018. The total number of milk cows on farms in the United States shows that California holds a significant share of the total number of milk cows in the country. Unsurprisingly, California is also the leading milk producing state in the United States. Dairy industry in the U.S. According to the USDA, milk from U.S. farms is 90 percent water, with milk fat and skim solids making up the remaining 10 percent. Cow milk is a component of several dietary staples, such as cheese, butter, and yoghurt. Dairy is a very important industry in the United States, with this sector alone creating significant employment throughout the United States. The overall income of dairy farms in the U.S. amounted to about 35.2 billion U.S. dollars. Holtsein is the most popular breed of dairy cow farmed in the United States. Holstein have the highest milk production per cow in comparison to any other breed. Where is the U.S. positioned in the global dairy market? Topped only by the EU-28, the United States ranks as the second largest cow milk producer in the world, followed by India, Russia, and China. The United States also features among the top ten global milk exporters. The outlook for the future of the industry is also good, with milk production in the United States projected to steadily increase over the next years. * As of January of each year. Including dry cows; excluding heifers not yet fresh. Milk market in the U.S.
Everything On "Milk market in the U.S." in One Document: Edited and Divided into Handy Chapters. Including Detailed References. Statistics on "Milk market in the U.S."